When I was in grade school, I read a series of stories whose main character was kid about my age named Homer Price who lived in a small town and suffered through hilarious misadventures with his crazy uncle and several friends. I was thrilled in the sixth grade to be in a class play based on one of my favorite Homer Price stories that involved a donut machine and a lost diamond ring. We handed out plain cake donuts to everyone in the auditorium with a fake diamond ring jammed in one of them. The person who found it was supposed to bring it to the stage so the play could continue. We had a lot of donuts leftover and my class ate them all. It started a life-long fondness for the fried dough rings. Don’t misunderstand. We’d eaten donuts before. My mom loved them as much as all us kids did. Mom was a great one for variety so we had chocolate donuts, powdered sugar donuts, cinnamon sugar donuts, toasted coconut donuts, peanut donuts, iced donuts, sprinkled donuts, and just about every other kind of donut in every color there was. We had only had plain donuts if they were included in a variety pack, and then only if the “better” ones were gone. There’s something about fried dough I find irresistible. Waaaay back in the misty yester-years, Wesson oil had a commercial where they took a loaf of unsliced bread, cut the crusts off, and plopped it into a pan of hot oil until it formed another crust. The point of the commercial was to show how little oil was absorbed by the bread in its second “cooking”. Every time I saw that ad, I wanted some of that bread. It seems like deep frying releases some kind of flavor component that makes food taste better. The Roy Biggin’s Rule of Party Catering was “If it’s green, it’s trouble. If it’s fried, get double.” That is so true. I live in the region of Indian Fry Bread and the Indian Taco. When I was a kid, I couldn’t wait for the county fair every year because that was the only time I could get it. Things change. I learned how to make it myself. Then I moved back to Ariz and found I could have it any day in just about any restaurant. Fried dough is wonderful. The glass was a present for Christmas from FiL and is a restaurant quality dome to keep things covered in an airtight container. I use it all the time for baked goods. The donuts that are in there were all that was left. And at the time of this writing, there are less than a dozen still remaining. By tomorrow, I don’t think there will be any. The iced ones were good, but the plain were outstanding. Using a mixer (don’t try this by hand), blend the shortening and sugar together until sugar is dissolved. Add the two eggs one at a time until well blended. Add the milk and vanilla and mix until light and frothy. Add the dry ingredients and mix until thoroughly blended. Remove from bowl and wrap with plastic wrap. Chill for at least four hours or overnight. Heat vegetable oil in a heavy pan to 375. Roll the dough on a floured surface to 1/2 inch thick. Cut out 2 inch donuts the best way you can (I have a donut cutter that I searched high and low for and finally found in the cookware section of a very large Ace hardware store. I also have a set of round cookie cutters that go from 3 inch round to 1/2 inch round. Two of these would do the trick, also.) Once the oil is hot enough, place as many donuts in the oil as you can without crowding them. Cook for a minute or so until the bottom side turns brown. Turn over and cook for another minute or so. Fry the donut holes, or re-roll them for more donuts. Total cooking time should not exceed 3 1/2 minutes. Drain on a rack over paper towels. Cool for ten minutes then ice them or sprinkle them or just eat them. ***NOTE: A few of things to pay attention to. First, the oil must be hot enough otherwise the dough will just absorb the oil and you’ll end up with crispy fried oil sponges. 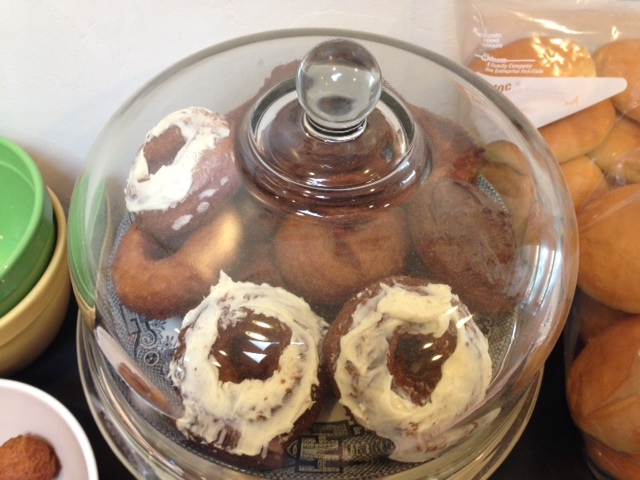 Second, the oil must be deep enough for the donuts to float without touching the bottom of the pan. I used one of my trusty cast iron skillets but the donuts expanded and got too dark on the bottoms where they touched the cast iron. Third, fresh nutmeg is the key to this recipe, and to the whole “old fashioned” donut mystique. It’s the flavor that makes it good. Mace is good, but can be omitted. Mace is the outer coating of the nutmeg and adds a depth of flavor. So now that I know what I’m looking for in donut recipes, I’ve decided two things. I’m going to continue experimenting with recipes (like I’d ever stop) until I find the “perfect” recipe. And I’m going to finally invest in a real electric deep fryer. I know that deep frying isn’t good for you, and I don’t intend to start deep frying everything, although I know people who do. But with the amount of frying that I’m now doing, it just makes sense to do it right. And stop burning my bottoms.